Where to do your ‘I do’s. . .
Congratulations on your wedding plans! The two of you have made the decision to get married, you may have set the date, and chosen a venue which suits you perfectly. Now you want your Wedding Day to be Just Right. I hope I can make your ceremony perfect. Love is a wonderful and exciting adventure! 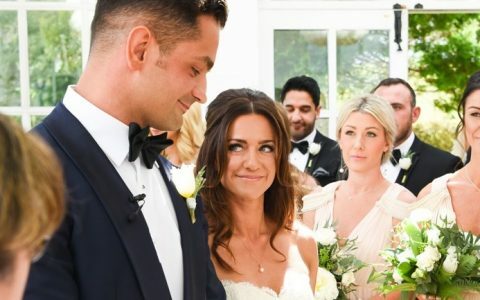 And there is, perhaps, no more significant day in your lives as a couple than the day you make the formal commitment to spend the rest of your lives alongside each other – your wedding day, where you start your married life together. Here is where promises will be made, vows undertaken, and your closest family and friends are invited to witness your pledges to one another to spend the rest of your lives as a married couple. Whether your ceremony is only a few weeks away, you are planning it for next year, or the one beyond, I will spend all the time it takes to help you to make your wedding personal, distinctive and utterly unique. As a celebrant fully accredited to conduct wedding ceremonies by Humanists UK, I would be delighted to walk alongside you on this journey. 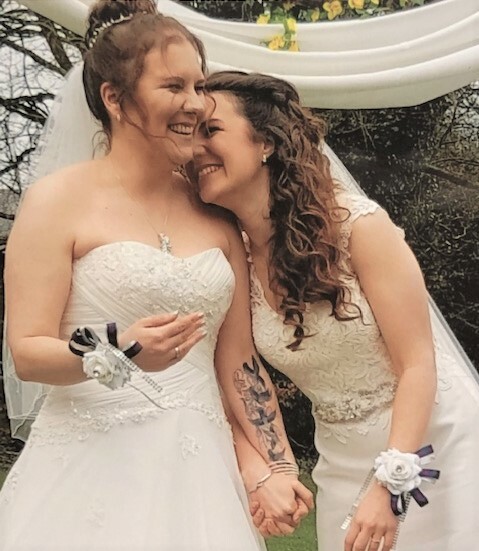 It is a great privilege to be asked to be part of two people’s lives at such a significant and personal moment, and I have loved working with a wide variety of couples. 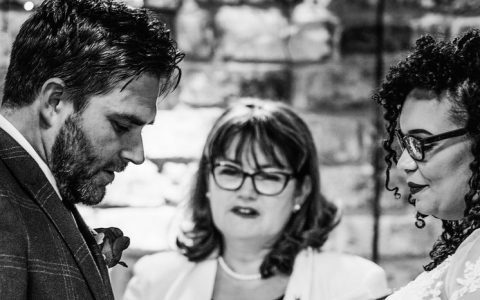 I immerse myself in your story, and thoroughly enjoy writing bespoke ceremonies, helping to guide you through the process of organising your wedding. Most of my wedding couples tie the knot in the North of England, from Berwick to Yorkshire, and West as far as the Lake District. I have travelled to Cornwall, and am more than happy to give a bespoke quote for destinations further afield or abroad. 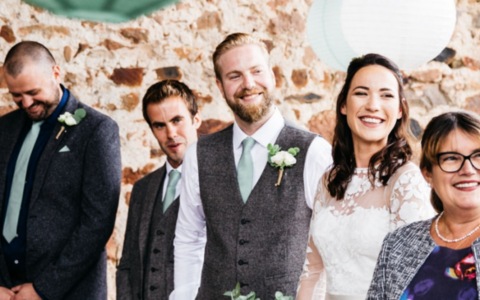 You may be looking for a traditional, formal ceremony; a small and intimate occasion; a festival-vibe; or a free-spirited, bold and adventurous affair. This is where I will work closely with you, supporting you in ensuring that the feel and wording of your ceremony is just how you want it. Alongside you all the way, we will create the perfect, highly personalised ceremony you are hoping for. After sensitively gathering background information about you, I will tailor your ceremony to reflect your individual personalities and wishes, creating a bespoke and memorable wedding which both you and your guests will cherish. I will suggest imaginative ways which can make your day truly unique, perhaps by also involving family members and special friends, providing a wide selection of readings and poems suitable for all kinds of weddings. 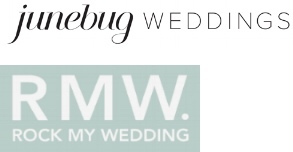 I am happy to help you both decide those which will suit your style and help your ceremony flow seamlessly. 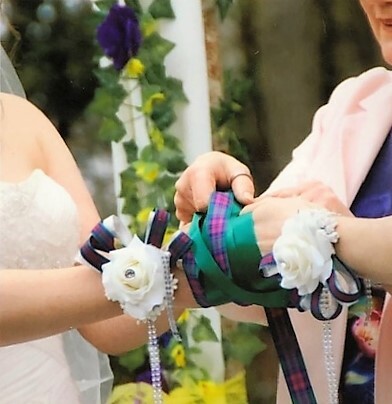 Having a bespoke ceremony means the possibility of including elements which you may not have come across before, such as incorporating a ‘Handfasting,’ where you symbolically ‘tie the knot,’ using beautiful ribbons, something with particular significance – the scarf, or necktie of a deceased relative, a piece of fabric from your travels, perhaps, or the family tartans. 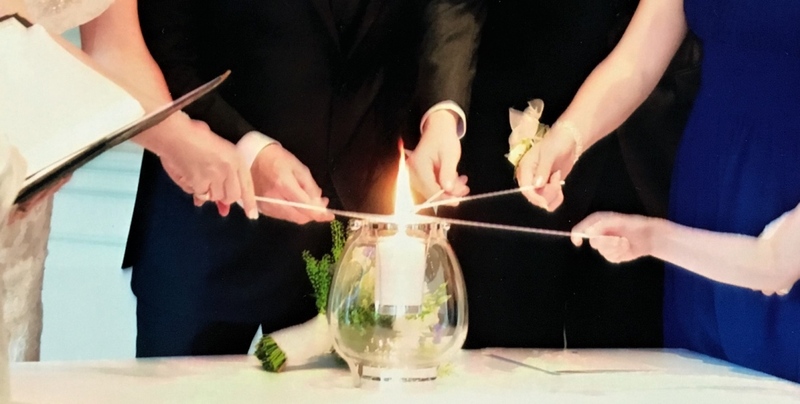 A ‘Unity Candle’ can be a delightful and deeply symbolic way of visually representing the joining of two distinct individuals into one married couple, and there are many other ways of incorporating a symbolic act in your ceremony – these will be discussed and their significance explained, and the choice will be entirely yours. 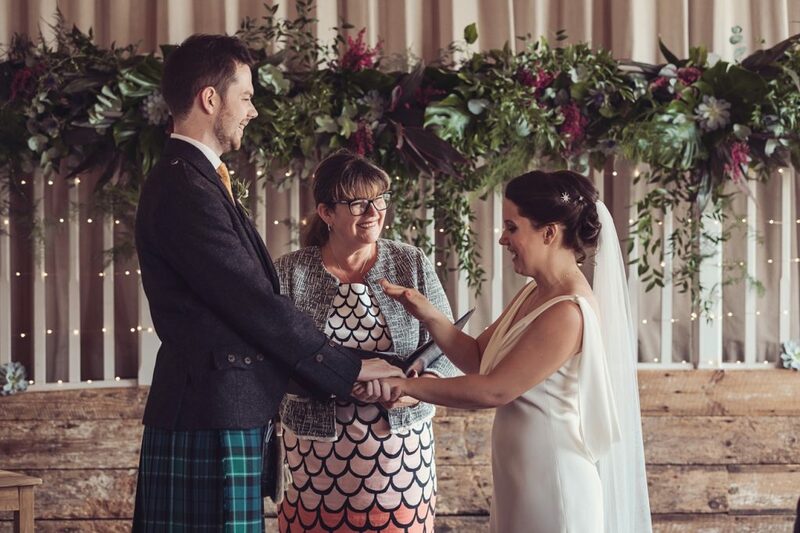 Your ceremony will be choreographed and stage-managed to the smallest detail, so everyone is absolutely clear about their role. 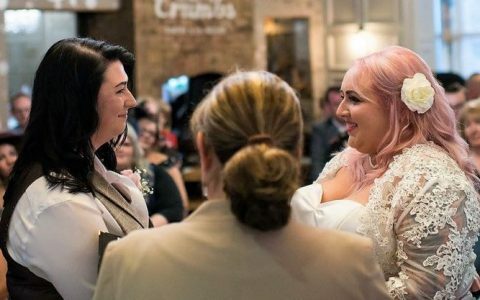 I will liaise with venue staff to ensure that they are fully aware of the ceremony content, providing a running order and confirming music choices. I’ll speak to any musical performers, and ensure that everything goes to plan with any other additional contributors. You both need to be able to relax and enjoy being the centre of your very special ceremony as you make your commitments and promises to one another and celebrate your relationship together! Always a calm and relaxed presence, I guarantee to officiate in a professional manner throughout. 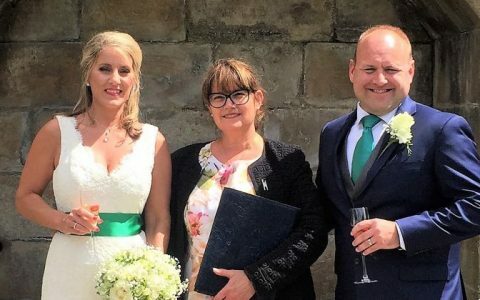 Though it is, I hope, only a matter of time before Humanist Wedding Ceremonies are recognised in law in England and Wales, as they now are in Scotland, Northern Ireland and the Channel Islands, the current requirements are that couples say the words and complete the paperwork which will make their union legal with a local Registrar. Most couples will do this in the days before or after the Wedding Ceremony, and occasionally on the day of the wedding itself. I am happy to advise on who to contact in order to do this. 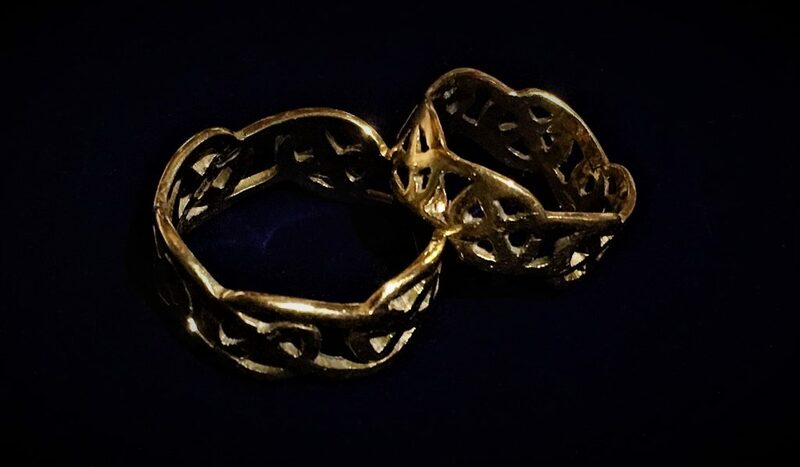 Whether you have been married for one year or sixty years, gone through troubled times, or had a relatively easy ride, married life isn’t ever all plain sailing, and increasingly, couples want to renew the wedding vows which they made to each other in times past. I would be delighted to help you to do this. To conduct a ceremony where you renew your vows in a way which reaffirms and celebrates your continued love and commitment to each other would give me the greatest pleasure. 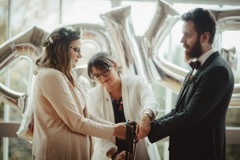 Ceremonies can incorporate any or all of the same elements as weddings, be as simple or complex as you wish, and I will put the same time, energy and commitment into constructing and conducting a renewal ceremony which is perfect for the married couple you have become.